The giant tube worms are large marine invertebrates that can rach a length of 2.4m and a diameter of 4cm. They have a highly vascularized red plume at the tip of their anterior end for exchanging chemical compounds with the environment. 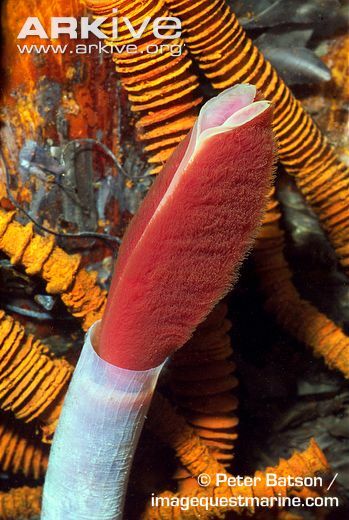 Since sunlight is not available in their natural habitat, the giant tube worm rely on commensal bacteria to oxidize hydrogen sulfide for them to use to respire. Reproduction occurs when female individuals release eggs into the surrounding water. As the eggs float upwards, the male individuals release sperm so that the eggs can be fertilized and develop. Live up to a mile deep on the floor of the Pacific Ocean near back smokers. They can tolerate extremely high levels of hydrogen sulfide. There is still much to be learned about the giant tube worms. The fact that they live so deep below the ocean surface means that humans have little interaction with them.